Want a simple and versatile earring design that you can replicate over and over again? This wire-wrapped briolette earring design can be used for any tip-drilled teardrop beads or briolettes. That’s what makes these some of my favorite earrings to make! The result is simple yet can look dramatically different depending on what colors and gemstone beads or crystal pendants you choose. You don’t have to be Frank Sinatra to do things your own way! That’s the beauty of metal stamping as a jewelry technique. Not only do you get to assemble components, you get to make your own components – and they can say whatever you want them to say! This Young Love bracelet is a perfect example of how you can easily customize jewelry with metal stamps! Click the image for a full tutorial. Letter stamps are the perfect way to create monogram jewelry, plus jewelry with names or inspirational sayings. Design metal stamps are the perfect way to add cuteness and panache. Learn to make these simple metal stamped earrings – just click the image above for the complete parts, ready to buy. Designer Amy Mickelson’s “Hootie and the Sodalite Earrings” feature custom owl charms she made using an ImpressArt Metal Stamp and a JBB Antiqued Copper Plated Square Tag Charm. These JBB tags are plated especially for stampers – pretty amazing! For more on these components, see the full parts list and tutorial here. The basics of jewelry stamping are easy and only require a few tools. The tools are a small investment, but will last for years and thousands of impressions! Metal blanks & tags – choose from 100’s of options! Once you’ve planned your design, secure your metal tag or blank onto your steel block with tape. Stamp Straight Tape by ImpressArt is more expensive than masking tape, but it offers a sturdier edge and does not leave sticky residue. Strike the perfectly vertical stamp with one firm blow. This is important for achieving a clear impression. Now you’ve got a custom made charm that’s uniquely made by you! That’s all there is to it! It really is that simple. Then, you can use your completed stamped charms to make earrings, necklaces, bracelets, gift tags, and more! Click this picture for all the parts and instructions you need to make these pretty necklaces. For a great monogram jewelry tutorial, see “Ava’s Ladies in Waiting” Necklace Tutorial in our Design Gallery. Click this picture for all the parts and instructions you need to make adorable metal stamped owl earrings. To make fun owl earrings, see the “Hootie and the Sodalite” Earrings Tutorial. Click this picture for all the parts and instructions you need to make a simple metal stamped bracelet. For the full how-to on making a metal stamped chain bracelet, see our “Young Love” Bracelet Tutorial. Rings & Things offers a huge variety of metal stamping blanks, plus jewelry stamping tools and supplies with fast shipping and free returns. If you haven’t yet jumped on the ear cuff bandwagon, now’s your chance! Some ear cuff designs include an earring post to hold the design in place, but many of today’s styles work for both pierced and non-pierced ears, making them as versatile as they are trendy. Customer service rep Tracy and Gallery guru Amy made the following Five Ear Cuffs to showcase some of the styles popping up. Lightweight plastic spike bead assortments give this ear cuff pizzazz and drama! When creating the cuff base with your 20-gauge wire, start by forming a “hook” from the back of the ear to the top of the ear – this is what will hold the non-pierced jewelry in place! Close-up of the “hook” at the back of your wire base. This one is covered with 1.7mm rubber tubing for a smooth finish. Curve the wire around to the front top of the ear and work your way down, shaping the base to the curve of your ear. Once you get to the bottom, leave a few extra inches of wire (you will form this into a spiral later). String on the beads from the bottom. Then, lash the beads with 28-gauge wire to help hold the spikes in place. Once the beads are in their final spot, create a decorative spiral with the extra wire. Once your beads are lashed, create a decorative spiral at the bottom of your base. With a separate piece of 20-gauge wire, make a figure-8 (infinity) connector to attach a dangling spike to the decorative spiral. Finally, slip the hollow rubber tubing onto the “hook” at the back of the cuff (illustration above). This covers up any rough wire end, which makes wearing your cuff comfy as well as stylish. Genuine watch gears lend a steampunk edge to this otherwise feminine floral design. As with the spikes cuff (above), extend your 20-gauge cuff base past the top front of the ear around to the top back of the ear and down. This is what holds this non-pierced jewelry onto your ear! Option: You can add 1.7mm hollow rubber tubing to the back of this design for a comfy, professional finish. A dab of Tenax Plus, or other super glue, can help situate larger beads and baubles that are difficult to hold in place with wire alone. In the example above, a dab of super glue holds the back of a flower petal to the wire cuff. This simple wire cuff sparkles with Swarovski crystal bicones and margaritas. Start the wire base by cutting a 2.5-inch length of 20-gauge wire. Divide the wire into thirds, and make a 180-degree bend at the one-third mark (so your wire creates two parallel lines at one end). Make another 180-bend at the opposite end. Curl each end of your wire (now in the middle of the design) into a small loop. The ends of your wire are hidden under the crystal embellishments, leaving the cuff ends soft for comfortable wearing. Now you’ve got your basic form. Use the center loops as a base for wire wrapping on beads and other sparklies. It’s easiest to lash these onto your cuff now while it’s still flat! (Or, for a basic wire cuff, just leave unadorned). Once you’re done embellishing, use a pen, pencil, or mandrel to bend the cuff into a shape that will fit around your ear. This classic-style ear cuff uses pre-made blanks. This ear cuff takes me straight back to the 1980’s, when I first wore cuffs make from easy-to-use pre-made ear cuff components. To make the rhinestone chain earring cuff above, use the parts list and how-to tips for the “Ode to Bajor” Ear Cuff Project in our Design Gallery. While this particular example requires pierced ears to wear, it’s even easier to create a cuff that doesn’t require piercings. Just add dangles to the hole in the ear cuff finding and you’re done! This East Indian style ear cuff uses 3.3mm chain instead of wire to wrap around the top of the ear. This sumptuous feast of dangles is inspired by Bollywood jewelry. Instead of a wire frame that wraps around the ear, jewelry chain drapes over the top of the ear and holds the dangles in place. It didn’t take long for us to realize that this style isn’t the best for a night of head-banging on the dance floor. For a candle-lit dinner, however, it’s just the thing! Cut the chain to your desired length, add your dangles, and voila! You’re ready for a night on the town. We’re going to keep watching this fun jewelry making trend. In the meantime, have fun making ear cuffs! You can buy wire, beads, and components right here at Rings & Things (just click the links in the parts lists above)! Apparently I’m not the only one who loves dressing up in ghoulish attire because our Halloween beads & charms are selling as fast as fun-size candy at the grocery store ! This hauntingly cool charm bracelet is made by attaching TierraCast Halloween charms and 4mm round Czech glass firepolish beads to a ready-made chain bracelet blank complete with clasp. Click here for a full parts list, suggested tools, & tips. Who doesn’t love easy earring designs? Choose from 3 different ceramic beads to make your favorite version of these cute seasonal danglers. The kidney wires insure a secure earring design that won’t fall out even during serious bouts of trick or treating! Parts list, tips, & suggested tools here. One of our most popular designs this season is the “Craneos y Flores” bracelet which links gemstone skulls and ceramic spacer gear beads. This project is great for el Dia de los Muertos too! Get the parts list, suggested tools, and tips here. These stylish harvest earrings pair Vintaj Natural Brass petal blanks, TierraCast leaves, and large bone beads colored with Vintaj Patina inks. This makes a great mixed media project for those of you who want to expand your jewelry making skills! Click here for parts, how-to tips, & suggested tools. For those of you who want to try metal stamping and riveting, this is the perfect project for you! Frame a spooky creature of your choice with a custom stamped brass frame. You’ll create a top-notch bar pin for your party agenda. Suggested tools, parts list, and design tips can be found here. Lady Skeleton Cameo ~ not a project, but isn’t it cool? Okay, I admit this lady skeleton cameo isn’t a completed project, but it’s currently my favorite Halloween component. It’s available in two sizes, too! Choose from 25x18mm and 40x30mm. What cool stuff can you make with it? If the above projects aren’t enough to get your spine tingling, find more Halloween & Day of the Dead jewelry projects in our Design Gallery. Growing up in the 1970’s, I predictably spent part of my childhood making macramé. In fact, I spent hours tied to the ends of masses of cording creating the ubiquitous plant hangers that have become an icon of the era. Call me sentimental, but I got a warm and fuzzy feeling when asked to dust off my knotting fingers and make a hemp macramé bracelet for Rings & Things’ Blog. First, you’ll want to gather all your materials — and a great thing about hemp bracelets is that they don’t require much! 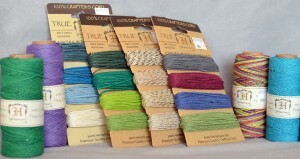 Hemp cord comes in a rainbow of colors, on your choice of spools and cards. For the beads, you’ve got a lot of options, but the important thing to keep in mind is that the hole size needs to be large enough to encompass two strands of cord! For 1mm hemp cord, the holes need to be at least 2mm wide (preferably wider). 6mm beads with 2mm+ large holes work great. Mirage Beads™ change color with slight temperature changes, like the mood rings of the 1970’s. For the bracelet pictured above, I decided to go full retro 1970’s and use barrel Mirage Beads™ since they are reminiscent of the mood rings that were popular back then — the beads actually change color with small temperature changes! C-Koop enameled copper cupped disk which worked perfectly to make a simple button-style clasp. Plan your pattern ahead of time to see how many beads will fit in the desired bracelet length. You can use just one type of bead, or create a pattern that alternates between 2 or more types/colors of beads. In the bracelet pictured above, I chose to use 7 beads in a simple alternating pattern that is symmetrical and centered, with an enameled “shortie” in the center: M E M E M E M. I also chose to space my beads so that the blue enameled shorties would NOT end up next to the blue enameled clasp (cupped disk). R G Y B B Y G R.
Find the centers of the 20″ piece and the 70″ piece and place the center loop of one on top of the center of the other. Line up the centers of your 20″ and 70″ cords. Loop the 10″ cord through the centers of both longer cords. Then, take the center of your 10” cord and make a half-hitch knot around the center of the longer four strands. Check to make sure the cording is still even and all ends still match up. Once all cords are even (symmetrical), make a half-hitch knot with the 10″ cord and pull tight. Now you’ll want to anchor the project, so you can make nice, tight knots. For a short project like a bracelet, a clipboard works great since it makes your project portable. Secure the short (10″) cord into the top clip. Pull the 20″ cords tight and tape them to the bottom of the clipboard. Leave the longest 2 cord ends dangling loosely. Once your cords are secured, you’re ready to start knotting. If you don’t have a clipboard, you can anchor your cords to a table top with tape. (When I was a kid, I anchored long projects by tying the anchor cord to my Mom’s cabinet handle and sitting on the center cords to keep them taut). It’s time to start knotting! This bracelet project uses a single basic knot, called the square knot (a.k.a. half knot). To create a square knot, follow the illustrations below, in which the long (knotting) cord that starts on the right is “A,” the two short (filler) cords in the middle are “B” and the long (knotting) cord that starts on the left is “C”. Start with cord A and bring it behind cords B, forming a loop (about the size of a 50-cent piece) on the right side. Make sure cord C is behind the long length of A (now on the left side). Start a square knot by taking cord “A” under both cords “B” and over cord “C”. Now, bring cord “C” over cords B and through the loop of cord A. To complete a square knot, pull cord “C” through the loop formed by cord “A”. Tip: The tighter the cord is pulled, the smaller the knot will be. Find your desired size and pull at that same tightness throughout the project for consistency. 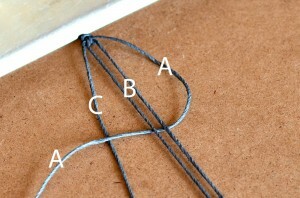 Repeat the previous 3 steps, but this time start on the left side with cord “A” to make your 2nd knot. Make your second square knot from the left side. Repeat again, switching back to the right side for the 3rd knot. Alternate sides for every knot (one knot starting from the left, the next knot starting from the right). Do this for approximately 20 knots. Be sure to create an even number of knots, and remember to pull knots consistently snugly. Hint: keep track of which side you are working on. After a knot is pulled tight, notice that the side to be worked on next is the side with the cord facing forward, not the cord facing the back. Once you’ve make about 20 knots, your square knot pattern should look like this. Note: It you continue knotting from a single side, instead of alternating sides, you will create a half-knot spiral (a.k.a. spiral stitch) instead. The spiral stitch is also really cool and can also be used to make a bracelet. Just keep in mind that it will have more dimension and will not lay flat. half-knot spiral (a.k.a. spiral stitch). Tip: to make stringing the beads easier (and help prevent the ends of the B cords from fraying), rub a dab of glue into each B cord end and form each end into a tip. Let the tips dry, then commence stringing. Slide your first bead over both cords B, and push it up close to the last knot (but don’t bunch up the knots). If the bead is difficult to slide over the cord, twist the bead as you push it on. Go around the beads with cords A and C, then make a knot as usual with cord A (starting on the right side, assuming your last knot before adding the bead started on the left). Push the knot up to the bottom of the bead and tighten to the desired consistency. Add 3 more alternating knots. Add 2 more beads the same way (adding 4 knots after each bead). Square knot pattern with 4 of my 7 beads added. Even if you’ve pre-planned your bead pattern, it’s a good idea at this point to test the length on your wrist (or ankle). Does it go about half way around? If yes, then this is the middle — only add 2 more beads. If no, then continue adding beads (with 4 knots after each bead). Don’t worry if it seems like the project won’t be long enough. That piece of cord hanging back at the beginning makes this project any desired length between 6 and 12 inches. After adding your last bead, make about 20 more knots (the same number you made at the beginning). To make a simple clasp: After you’re done knotting, slide your large bead onto all 4 cords — if it fits. For the cupped disk, I improvised since only 3 of the four strands would fit through the disk’s hole. I knotted one of the middle (B) cords snug up against the last square knot, trimmed it flush and added a drop of glue. Since all 4 cords don’t fit through the cupped disk, I finished one of the “B” cords with a knot and strung the remaining 3 cords through the cupped disk. Then I cut the knotted “B” cord flush and added a drop of glue for security. Pull all (remaining) cords snugly and tie a knot. Trim the ends and add a dab of glue for extra security. This forms the “button” or “hook” part of your clasp. Measure bracelet on wrist (or anklet on ankle) to find your desired length. On the opposite side of the bracelet (the 10 inch length of cording), tie a knot where you want the bottom of your loop. (Since my wrists are small, I was able to start my loop right next to the macramé section, and did not need to create this first knot). Determine how long the loop needs to be for your “hook” to go through it and hold (about 3/4 of an inch worked for my design). At that spot, tie another knot to complete the loop. Trim excess cord and apply a drop of glue to secure the knots. Close-up of the finished button-style clasp. You can alternately use a metal jewelry clasp by tying it to the finished ends of your knotted strand. Once you’ve got the hang of the square knot, these bracelets are a snap to make, and it won’t be long till you’re coming up with an array of variations! Macramé bracelets made with hemp cord. Some use a square knot and others use a spiral knot. Macramé bracelets make great inexpensive price points for craft fairs and festivals, as well as great gifts for old friends and new. With so many vibrant colors of hemp cord now available, the possibilities are endless for design variation.